Interested in sleeping soundly? 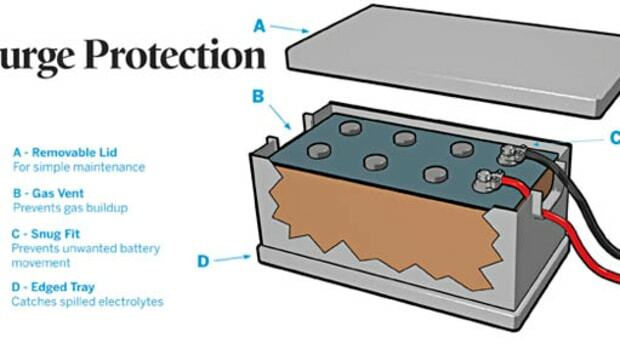 Power up your air conditioner with your inverter. The owner of a Bertram 700 wanted to relax while at anchor in cool, quiet comfort. The cool part was easily covered thanks to a Marine Air chiller system comprised of four modular units. The challenge was the quiet part. Having the boat’s generator kick on to start the compressors wasn’t exactly silent. 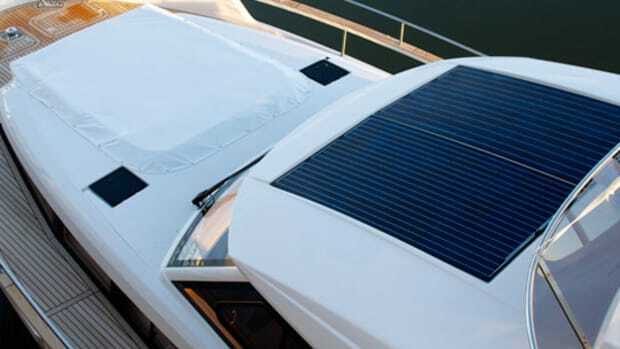 Dometic Marine’s SmartStart was the answer. 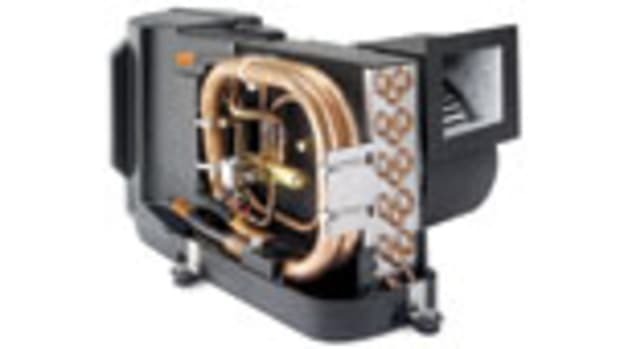 The device uses “soft start” technology to reduce the power surge required to start an air conditioning compressor. 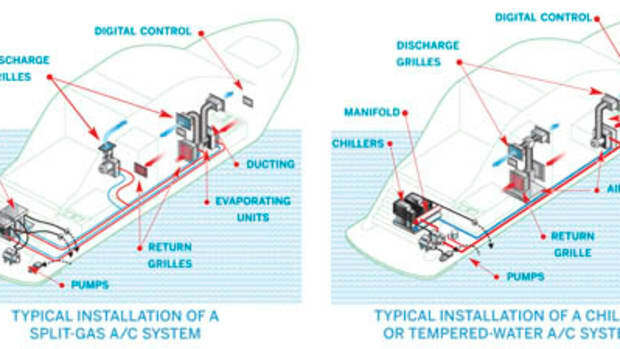 Engineers from Dometic and Bertram first wired the master stateroom’s chiller unit into an inverter, a device that makes much less noise than a genset. Then, since the inverter couldn’t handle the compressor’s start-up amperage draw, they installed a SmartStart ($450 retail plus an hour of labor) and reduced the initial draw enough so the inverter could both power up and run the chiller, as well as a few other small appliances. 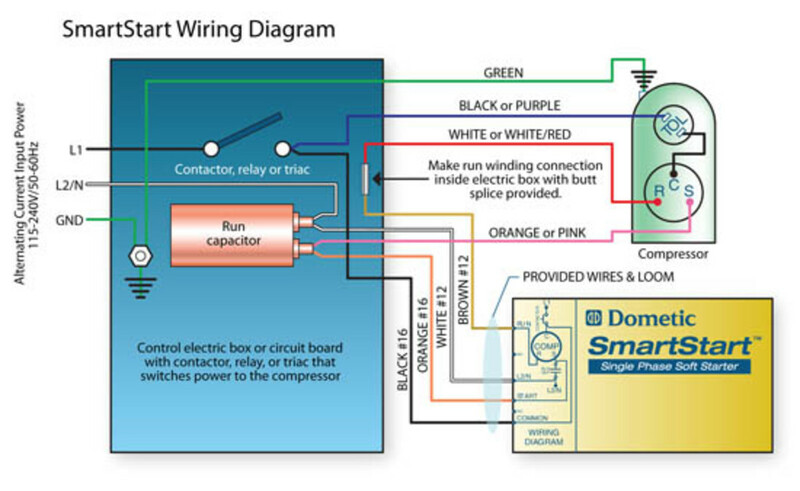 When wired in-line between an air-conditioning system and an A.C. power source, SmartStart reduces the energy required to start the compressor. To limit the inrush of current needed to crank a large compressor, SmartStart uses dynamic feedback control, a technology that produces a comparatively slow sequential start-up. 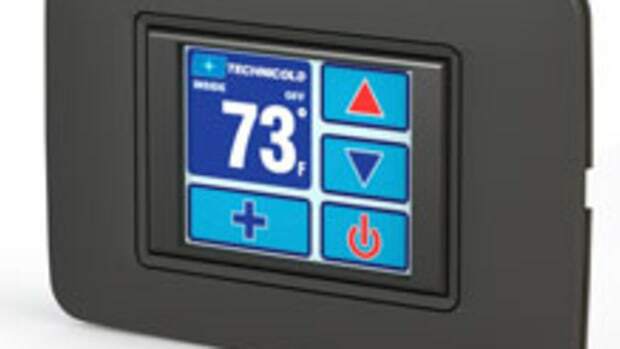 According to Dometic, this reduces surge up to 65 percent. 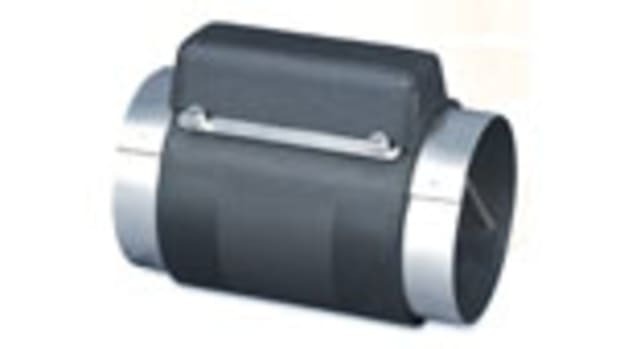 Once a compressor is running, of course, its amperage draw drops significantly. 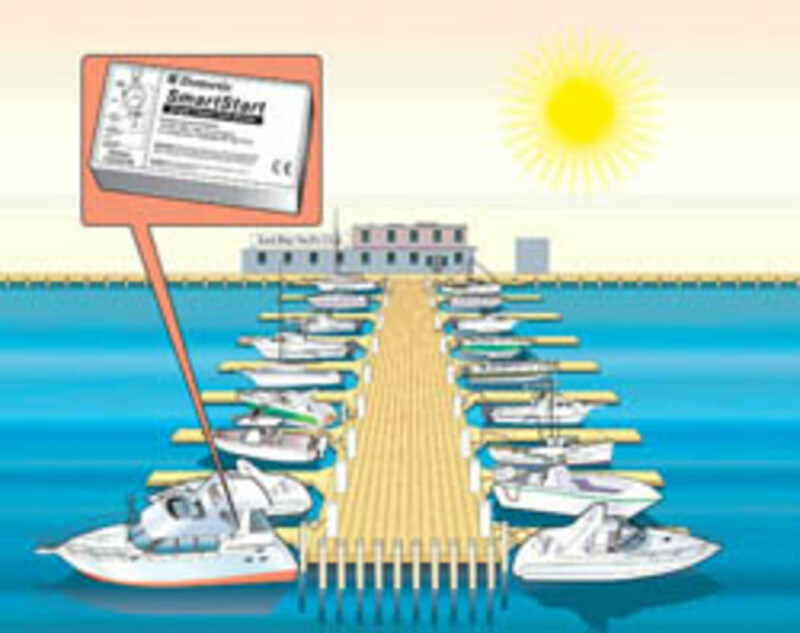 Beyond quieting down things, SmartStart can help with overstressed shorepower cords or poor dock wiring. Say it’s August, and you’re docked at the end of a long dock at a Miami marina. It’s a full house, and every boat has air conditioning going. 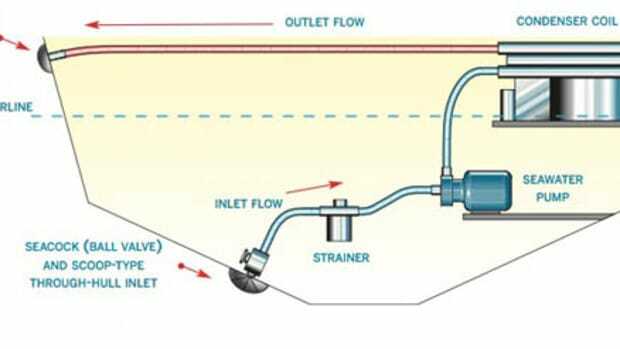 Unless you’ve got SmartStart, it’s likely that by the time the power reaches your boat, there won’t be enough current to start your compressor. 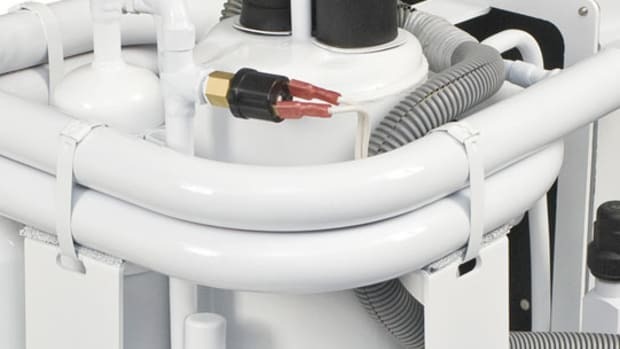 Overloading your boat’s power source with genset surge won’t necessarily cause major damage, by the way, but it’s not something we recommend either. In a worst-case scenario, however, an overload may cause a temporary shutdown of everything aboard, a development you’ll hear about if your kids are watching their favorite movie or your wife is blow-drying her hair. 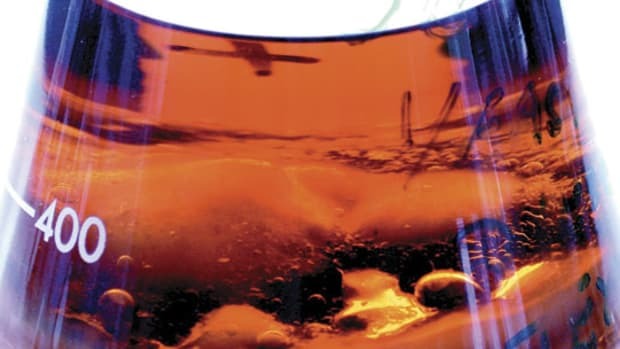 A shutdown can also cause onboard computers and navigation systems to run slowly at best or reboot at worst. And on big charter boats it may cause guests to become disgruntled, questioning why they are paying big money to sit on a 100-footer in the dark. The Bertram 700’s owner got it right. Whether you want to extend the surge capacity of a generator or inverter to produce a quieter onboard ambiance or save fuel costs and energy by not having to upgrade to abigger generator, using SmartStart is—well, a really smart idea.